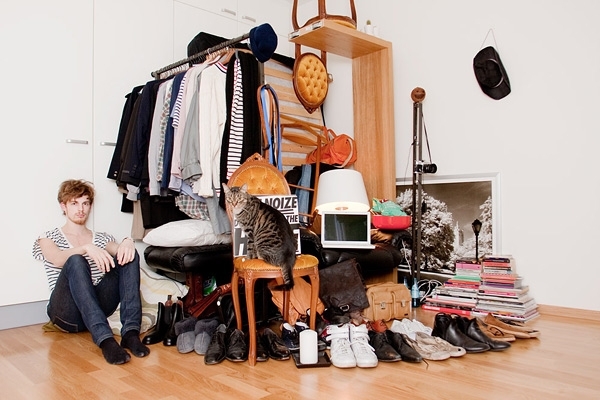 Can you fit all your belongings in one photograph? Gothemburg-based photographer Sannah Kvist created a collection of photographs entitled "All I Own" where Swedish students were pictured with sculptures made from all their possessions. The result makes us question what we really need for living, if we are buying too much crap, and if it's true that less stuff leads us to more freedom. “All I Own” was inspired by Kvist’s own experiences – she moved to a flat in Stockholm in a truck full of stuff, then left the city with just an IKEA bag with her computer, camera, and a few clothes. She says that people born in the 80’s — like the ones on her project — are the first generation of Swedes that are less well off than their parents. Many people she knows change houses frequently and don’t own property, yet they are commonly described as selfish and materialistic by their elders. Well, judging by these pictures they don’t look materialistic – instead, their possessions offer a compelling case for anti-consumerism and make us re-think which objects we really can’t live without. A really good short article, but very powerful. I was inspired in this direction by a book called, "Material Possessions" and after living in a vehicle as a student for over a year. I found myself thinking differently about stuff, and while in the van, I had two storage units. I'm still working at it to this day, almost two years later, and my load is so much lighter. I've sold and donated hundreds of items and now its starting to feel great inside to give away things! I recommend anyone try minimalism. You'd be surprised what you don't need and do need, and I would contend that most of these people are minimalists, mainly by choice. It's sort of funny when you think that all the corporate greed that inspired us to move into materialism is now forging this generation of younger people and people my age who are realizing that they don't need much of anything! I still have nice things, and I'm proud to rock those FEW nice things in my life. But I'm always looking for a way to slim down. And yes, critics, (we can tell the state of affairs in ones mind by their criticism) I do have a large container in my parent's attic. But each time I visit my home state I find myself ridding of it. It's a state of mind-you can't use the criticisms that govern materialism to understand what you need. Great initiative to show we could all live with less material things and possesions. Doesnt really matter whether they are students or not. The concept is the same: less material things and more experiences and feelings. I like the fact that they show few clothes and furniture, laptops and some music instruments. The work might be completed by showing any other type of people or just professions but in any case, great work, I love it! I find it amazing every comment on here is negative. Don't you have anything positive to say? I find it an interesting set of photographs I can relate too as well. They inspire me to live with less stuff. Nice work. Thank you. What\\\'s so great about these pictures? That is exactly about as much as ANY student would posses. Student\\\'s are poor, and that is usually about the amount ANY student would own and posses. Secondly, in Europe, (and when I say Europe I mean Western Europe where it is DENSELY populated) they can\\\'t own as much as people who live in say, the United States..... Yes, we consume too much, spend too much, but we have space where we can do these things. It\\\'s not like these students here that are being showcased are doing these things because they are choosing to, it\\\'s that they have no other choice because of the usually small apartments some live in, and because like I stated before....usually students are much poorer during those formative years in their lives. Let\\\'s not make them out to be "Pioneers" Seriously! I\\\'m all for living simple, and with less. But, it\\\'s getting extreme..... Let\\\'s all just take it down a notch....shall we? The people on the photos are way to college-like. As a college student I had probably less stuff than these students. But still a great visual concept! \\\"they are commonly described as selfish and materialistic by their elders\\\" For others, the most annoyed by us, our own defects ... Today we do not need books, CDs and movies, TV set ... everything we have in our computer ... Our clothes wear out faster and are cheaper ... We have not been eating at home, do not training their own equipment ... We have less and less, and very well! Clinging to material things make us poorer and more vulnerable to pressure from banks and employers. Who has nothing is really free. Wow, when I was a college student thirty years ago and even beyond I had much less than any of the above photographs. No tele and far fewer shoes but I did have tons of albums. Everything fit into my volkswagon. I don't think furniture was or is very important to college students...which is what takes up much space. And, seriously? All young people get harassed by their elders...this will go on forever and rightly so. It is up to the elders to keep the young on their toes!!! Awesome statement, but wouldn't it be more telling to photograph adults in their 40s? When I was a student, I likely had less stuff than any I saw in these photos. Students don't own much. Also, I didn't live at home. I left home at 14, so I had no home base in which to store what didn't fit in my college dorm. The most cumbersome possessions I had in those days was my milk-crate contained record collection. "All I Own" was inspired by Kvist's own experiences - she moved to a flat in Stockholm in a truck full of stuff. Then she the city with just an IKEA bag with her computer, camera, and a few clothes. She says that people born in the 80's -- like the ones on her project -- are the first generation of Swedes that are less well off than their parents. Many people she knows change houses frequently and don't own property, yet they are commonly described as selfish and materialistic by their elders. Well, judging by these pictures they don't look materialistic! Instead, their possessions offer a compelling case for anti-consumerism. Kvist's photos make us re-think which objects we really can't live without.